If you have been keeping up with AutoCAD 2008, you know the idea behind Annotative Scaling as it relates to text. The general concept to make it possible to do in one object what once required we use multiple objects. I am of course speaking about copying a piece of text numerous times just so we could plot a drawing at different scales. Personally I would have been happy just to get Annotative Scaling with text in AutoCAD 2008, but the folks at Autodesk were apparently swinging for the fences as they have hit a home run. See, Annotative Scaling isn’t just for text; we can also dynamically scale things like blocks and hatches. While a large number of blocks are drawn with real units, others are purely for graphical representation and well scale dependent. We typically have to illustrate waterline designs on both normal plan sheets (1″ = 50′), and on at least one overall plan sheet (1″=100′). With that we frequently find ourselves copying our waterline valves multiple times to properly illustrate them at both scales. A scenario such as this is where Annotative Scaling for Blocks can truly shine. Defining an Annotative Block really isn’t any harder to do than defining a normal block in previous versions of AutoCAD. You will still start by drawing the objects you wish to make a block in your drawing, fire up the BLOCK command, and finally select the objects & specify a base point. The addition you will notice is under “Behavior”. Inside of the “Behavior” group we now have an “Annotative” option. To make it so this block can take advantage of the Annotative Scaling options within AutoCAD 2008, check the “Annotative” check box. With “Annotative” enabled (by checking the checkbox), we can tell AutoCAD to automatically rotate the block to match its viewport by checking the “Match block orientation to layout”. I want to keep my water valve blocks rotated as I insert them into my drawing, and thus will keep that checkbox unchecked (as illustrated). That’s truly all there is to creating a new Annotative Block. But what if you want to convert an old block from a previous release into an Annotative Block? Exploding it and redefining it is what the hourly employees do when they need a few more billable hours. Smart drafters can simply open the BLOCK command. Contrary to popular belief we can actually do more than create new blocks from this dialog. Simply select the name of the block you want to convert to Annotative from the pull down (where you would traditionally type the name of your block). Select the “Annotative” checkbox as outlined above, and hit [Ok]. AutoCAD will prompt you and ask if you want to redefine the block â€“ answer yes, and your block will now be an Annotative block. Some good news, and some bad news. Blocks can be both Annotative and Dynamic. Unfortunately if you take a Dynamic Block and use the method I outlined above to convert it to an Annotative block, it will make it Annotative, but also strip ALL of its Dynamic Block Actions and Parameters. Also while you can have an insertion point per Annotative Scale (so one insertion point for 1″ = 50′, and another for 1″ = 100′), you cannot assign different visibility states (Dynamic Blocks) per scale. The functionality introduced in AutoCAD 2008 with Annotative Blocks is something I have been looking for inside of AutoCAD for some time now. While I haven’t redefined my entire block library yet, you better bet I am already thinking of how to best use Dynamic Annotative Blocks to make things easier for my users. Surely with a little imagination you too will be able to see numerous opportunities in your shop as well. Is it possible to edit a block within a drawing and maintain the annotation? We use bubbles around text and would like to change the text within the bubbles. When I explode the block to change the text, it no longer changes with the annotation scale. Hope that makes sense and you have some insight. I have a number of existing drawings with many individual blocks in them that I would like to make annotative, has anyone come across a way of changing them all in one go instead of singularly ? You may want to check out one of my other posts on making an entire drawing annotative. Off hand, I’m not sure of a way to “redefine” a block contained within a drawing. Recreate the block as an annotative block with the same attribute names as the non-annotative one you had and insert an instance of it in the same drawing. Then that instance to your desktop with the same name as the non-annotative block that’s being used in the drawing. 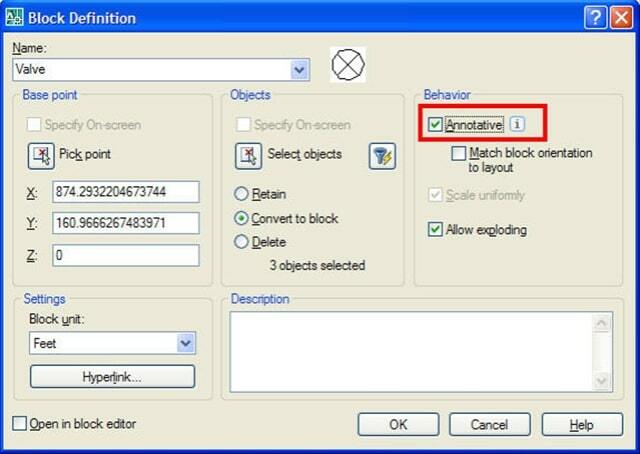 Then re-import from your desktop and overwrite block definition. Last step is to that block. I noticed in this column that you mention what happens to a DB when you make it annotative…i.e. stripping it of all its actions & parameters. I am currently using release 2009 and I’m running into the very same problem. Been trying to find a fix. It sets up correctly….makes it annotative alright….but, you loose everything else about the DB. Couldn’t find anything on AUGI’s website. Is there something that can be done to keep this from happening? I mean, why even make a DB annotative if it’s just going to strip the very functionality that you wanted in it in the first place? Quick question. I have an existing column bubble block. I went into the block and changed the text to my annotative style. I also clicked the annotative box in the block dialog menu. When I insert this block at various scales, only the text shows up, and not the circle around the text? Any thoughts? Jared – Remember, blocks are a collection of AutoCAD entities. That said, if I had to guess, I’d take a look at your block definition, and make sure it is Annotative. Sounds like the text is annotative (and thus reacting to your annotation scale), but your block isn’t. Hope that helps! Hi, I have a little issue with annotative objects I would like to comment if you do not mind: I have acad 2010 and I did my base archives with annotative blocks and dimensions. When I referenced this file to another new file and put the scale on it viewport, having same scales on both, archive and blocks, the scale does not work. It is very strange. I have created an annotative block and after I enter in text only questions marks show up…. any ideas? These blocks were working fine one minute and all messed up the next…. I don't get it. Based on your comment, I'm not completely convinced the problem is with the annotative element. Instead I suspect it may have something to do with the text style being used. I forget if it was 2009 or 2010, but Autodesk did change the Standard text style in the acad.dwt from simplex to Arial. As a general rule you shouldn't have too many issues with this, however it's possible. Thus I'd have a look at the text style being used in the block and make sure my dwt and my block match from a text style perspective. I have found similar problems when it comes to some of our xref drawings. What I do isn’t ideal but it works. I use the text background mask but set the test very small, tick set the use background mask and use drawing background colour. Then grip the text so that you get the grips at the edge of and pull push as required. You might even need to have overlapping ‘masks’ depending on what you are trying to achieve. In regards to Shane’s question about liens that are trimmed and your response, we have a similiar issue, though not only with valves, but round rises and drops as well, from what I read on wipeouts they cannot be round, so it would be difficult to use a wipe out and white hatch is out as well as we use the merge lines feature for printing. Any suggestions? @Diane – Check the annotative lightbulbs in your status bar. When setting up the VP you may want to make sure both are enabled. Aside from that keep in mind ACAD looks at the scale name, not the scale itself. In otherwords if you had 2 annotation scales, one named 1:40 and another named 1″ = 40′, but both setup to be 1:40, AutoCAD would treat these as two separate scales. Thus items in the 1:40 VP won’t (by default) display in the 1″ = 40′ VP. Thanks, I appreciate the reply. I’ll try that. New question. My annotative blocks will perform the way they are supposed to in a single viewport. That is, when annotative scale is changed from 1:20 to 1:40, they appear the correct (appropriate paper space) size. However they don’t appear to be the same paper space size in two different viewports, given two different annotative scales. It shows on screen temporarily and then reverts to too small etc. in the viewport that does not support that scale. Are there any settings that you know of that would stop this from working? 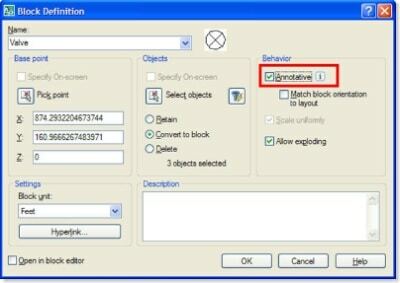 Diane – Annotative objects are known for disabling the modify commands in AutoCAD. The quickest solution I have been able to find is running the AUDIT command and answering No. Counter intuitive I know, but has worked like a charm for me. I have worked with annotative blocks and text only as test files. they seem to work really well. the only thing I can’t understand is the annotativedwg variable. I want to be able to erase, move and edit blocks. But, I can’t seem to control this variable. It will change to read only for the annotative object. I then, can’t erase or move it. I try to change it from 0 to 1 but can’t access the command. I have read the help menu on this variable. One day I can move erase and edit, the next day in the same drawing that variable is 0-read only. Martyn – Admittedly I havenâ€™t had a chance to play around with annotative attribute blocks too much quite yet. The ATTDEF (Attribute Definition) dialog allows you to specify both a text style, and if the attribute is annotative. Make sure you are selecting a text style which is annotative. While the ATTDEF command offers you the option to make an attribute annotative, if the text style is not annotative things donâ€™t seem to work. I use blocks for physical entities (air-handling units for example) with attributes to specify the make, model etc. Obviously the geometry of the block is inserted 1:1 (ie non-annotative) but I would like the labels to appear at the appropriate scale for the viewport. I have defined attributes with Annotative set ‘on’ and with a range of scales but when inserted only text with the scale active at the time of definition appears – change the Annotation Scale and the text disappears. AutoCAD’s help/info seems to imply that my aim is possible but how do I achieve this? In response to Karen’s problem of the circle on the wall. Experiment with the ‘align’ option in your dynamic block. You can have a single quadrant as your base and the circle will rotate based on whatever object you are inserting to. @ Shane – The two things that come to mind that may work is using a wipeout or a solid white hatch. Not the AutoCAD standard color white, but the True Color 255,255,255 white. You may be able to trick AutoCAD into making it look like things are trimmed. That is all assuming you are not plotting to a Lines Merge plotter as well. I think this is a great feature for inserting valves on piping. I do see a drawback however. If you create valves for lets say a 1/8″ scale drawing, then insert them and trim the pipe, the trimming would creat issues for a 1/4″ scale drawing. Since the cad blocks are larger for the 1/8″ scale drawings, trimming the pipe to the block will creat gaps between the pipe and block in the 1/4″ scale drawings. Any suggestions? The other day I was reading your informative article in the May/June AUGI World and the next day I got my trial version of vanilla AC2008. Annotation was the first feature to jump out at me and I read in Help that this feature could be applied to blocks, but, after searching AUGI fourms and Help, I assumed it was for only block attributes. Thanks for highlighting this feature! Donnie- I did send you an e-mail with a dwg attachment; I hope you received it. Karen â€“ My apologies for the somewhat delayed response. I may not be visualizing this properly, but it seems like you have a block that gets inserted against a wall. Could you use a single insertion point, and deal with the rotation aspect of things with either a dynamic block or even tool palette? Again I may not be visualizing this properly, but if you e-mail me the block/scenario Iâ€™ll be glad to take a look (donnie.gladfelter@thecadgeek.com). I insert a block which is a circle that represents a fire extinguisher in plan. I need to put it up against a line that represents the wall. That insertion point could be on any of the 4 quadrant points of the circle. It works fine if you’re only using one scale, but as soon as you change scales in model space, the circle is either on top of the wall or not even touching it. How can I get that block to stay put without defining 4 of the same block with 4 different insertion points? Thanks! I would only use one insertion point and put a rotate parameter on the block. Then you can just rotate it so that the same insertion point is on the wall, no matter what direction it is facing. The block should scale automatically from that one insertion point (I assume)…and that will keep it against the wall. I haven't tried it but that is my guess on how to fix it.